Looking for something new? Ever heard of hand-pulled noodles or fluffy ice? Two concepts that are hugely popular in other parts of the world have finally made their way to St. Louis and Corner 17 is the place to discover them. Located in the heart of the Delmar Loop, this new hotspot serves up several noodle and rice dishes as well as your traditional and not so traditional bubble tea. We managed to snag the last table available when we arrived on a Tuesday night around 6:30 p.m. and the restaurant remained 100% full the entire time we were there. The diners at this restaurant represented the Loop demographic perfectly and included families with children, international students, and couples. There were only 2 servers working the whole restaurant but they moved at warp speed and we were served right away. 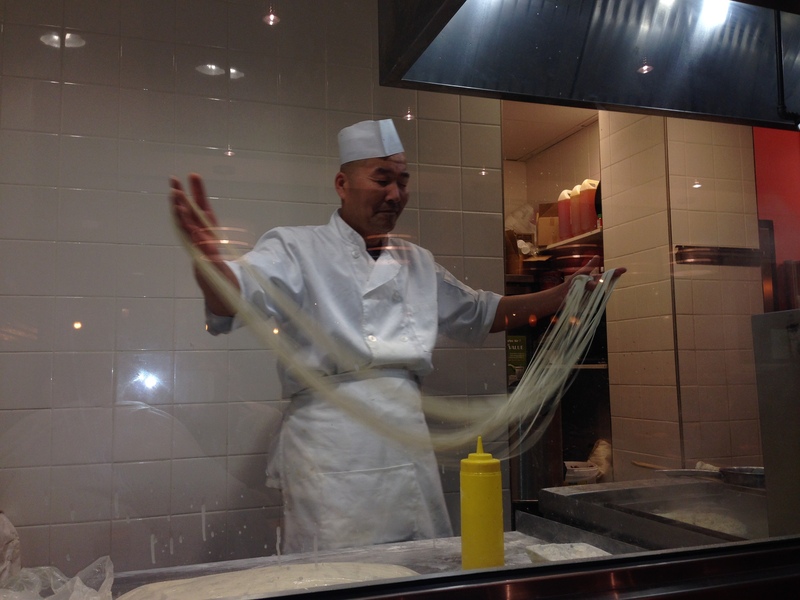 The origin of hand-pulled noodles can be traced back to China where dough is repeatedly pulled, stretched, and folded onto itself. Once the dough is the proper consistency, it is stretched to arm’s length and folded into a loop at which point the process is repeated until multiple strands are created. It is then separated and placed in a pot to finish cooking. What makes Corner 17 special is that this is done at the back of the restaurant behind a glass wall so you can watch the whole process. We started with bubble tea and we immediately noticed that unlike most bubble tea that is served in plastic cups with a sealed plastic lid on top, the tea at this restaurant is served in nice glassware. I chose to try a flavor new to me, red bean milk tea. You already have to be okay with odd textures to handle the boba (tapioca balls) that is in bubble tea but you really have to be ready for the red bean tea as it has actual pieces of beans mixed in to the drink which I happened to love. Based on the recommendation of the server, my husband chose lychee milk tea. We decided that this must be an acquired taste as it tasted similar to what I would imagine floral perfume would taste like. However, the server happily exchanged it for a taro milk tea which was 100% more palatable. Our food arrived shortly thereafter and I was served spicy tofu with steamed rice. This was a very healthy portion of food which lasted me another two meals. When they say spicy, they mean spicy, but the flavor was delicious and although they could have gone a little lighter on the oil, I would happily order it again. My husband chose beef noodle soup. The huge bowl was filled with the hand-pulled noodles they are so well known for as well as big pieces of beef. This is not something I would order on a first date because the noodles can be a little cumbersome to eat but they are so fresh and have such a perfect texture that you would be doing yourself a disservice if you skipped out on trying them. The beef was just a little bit fatty but my husband thought the flavor was just right. We thought we were finished with our meal until we saw another table with the most intriguing looking dessert. We decided to order it and we were served a giant plate of mango fluffy ice topped with mango sauce and fresh fruit. This was the lightest, most refreshing dessert I have ever eaten and I would return just for that! Overall we really enjoyed this meal and loved the quick, friendly service. The price is right and it is great for a quick bite to eat if you are looking for a cuisine that is a little out of the ordinary.